This relatively modest building sat across from the magnificent Marine Building, and was completed a few years earlier. Today’s building is numbered as 999 West Hastings, and while this is the Burrard Street façade, the Seaboard Building (as it was later known) also took a Hastings address, as 991. Home to the Canadian Australasian Royal Mail Line offices, it was designed by Townley & Matheson. When it was built in 1926, the windows looking north (on the left of the picture) looked out over Burrard Inlet, although today there are large newer buildings obscuring that view. Several other companies occupied offices here, including another shipping line. Initially it was named after its developer, and main tenants, and so was the Bell-Irving Building. Once it was built it appears that all of Henry-Bell Irving’s interests were run from here, including BC Packers and the Insurance Agency, founded in 1906 and spun off as a subsidiary private company in 1920 as Bell-Irving, Creery & Co. Ltd. In 1930 the company name was changed to Bell-Irving Insurance Agencies Ltd. Bell-Irving Insurance was a provider of property and maritime insurance; its principal clients were other companies in the Bell-Irving commercial sphere, including Anglo-British Columbia Packing Co. The company was also involved in real estate development and speculation. In 1972, Bell-Irving Insurance Agencies Ltd. merged with A.E. Lepage. We documented Henry Bell-Irvings history in an earlier post about another Bell-Irving Building. A Scottish railway-building engineer and briefly an architect, Henry Ogle Bell-Irving established a real estate, finance and resource empire, launching his own salmon canning business in 1889 and still its president at the time of his death in 1931. Originally there was a house on this site, home to William Murray, manager of the Bank of British Columbia in the 1890s. Today there’s Axa Place, built as the Daon Building. It’s an angled tower of gold glazing and brick. The building was the result of intense discussions between the architects, Musson Cattell Mackey, and the City. The final result met the City’s goal of opening up the street end view to the north (though somewhat obscured today by the large trees in the plaza out front) and providing a design scaled to respect the Vancouver Club, its immediate neighbour to the east, and reflect/refract views of the Marine Building across the street. We posted another view of this building two years ago. It was actually just on the edge of the previous post as well, as it’s across the street from the junction of Water Street with Cordova. Our earlier image dated back to 1890; here’s how the Bell-Irving block looked in 1932. It had been repaired by Schofield & Cox for Rand Brothers who presumably owned it then, to a design of W T Dalton in 1901. In 1932 all the businesses are moving out – Ward’s first class Shoe Repairing; Peter Greenall’s store that sold birds, seeds and supplies and the Cash Register Store who, not surprisingly sold, overhauled and repaired cash registers. In future the shoes would be repaired on Cordova, the birds supplied on West Hastings and the cash registers fixed on Pender. In the adjacent building Robert D McMillan’s cleaning store had already relocated. The building was another Bell-Irving development, but unlike the older building on the corner which he designed himself, in 1910 he hired Dalton & Eveleigh for the building to the south, built by William O’Dell at a cost of $15,000. The building to the east on Cordova is more of a mystery – it was already built before 1900, and appears to also be known as the Bell-Irving block in the 1896 street directory, and it might date back to 1888 like the corner building, when it was occupied by bankers Bewicke and Wulffsohn, who owned a very substantial $60,000 worth of property in the city at that time. Mr Wulffsohn was a German who achieved some notoriety, especially during the first world war. A Portland, Oregon, newspaper reported in 1915 “Charged with insanity, Johann Wulffsohn, ex banker and German Consul at Vancouver, B.C. was taken to the county hospital late today to await a hearing before the Lunacy Commission next week. The insanity complaint was issued at the instance of Mrs. Wulffsohn, who accompanied her husband here when the European war began last August. When arrested today J Wulffsohn was wandering about downtown carrying a bouquet of roses and a new broom. He had a number of pawn tickets and told police officials that what was left of the wreck of his banking business had been destroyed by the war. But Mrs. Wulffsohn explained the pawn tickets tonight by saying it was one of her husband s idiosyncrasies to purchase jewelry and to pledge it for loans. A Vancouver newspaper was quoted as well “Johann Wulffsohn came to this city more than 20 years ago. He was engaged in the banking and real estate business as head of the firm of Bewicke & Wulffsohn, and made large investments here on behalf of German clients. Later he devoted his time exclusively to the consulate, and was looked on as a man of eccentric habits. He figured in several sensational episodes, notably on one occasion on which he returned from a leave of absence and found that his deputy had entertained lavishly on the occasion of the Emperor’s birthday. Bills of many hundreds of dollars flowed in on Wulffsohn who one evening invited his deputy out on the lawn in front of the Hotel Vancouver, and there the two men fought and wrestled for a quarter of an hour. When last in Vancouver a year ago Wulffsohn appeared quite prosperous and still cultivated in his personal appearance a remarkable likeness to the Kaiser, especially in his military moustaches. Wulffsohn Is about 57 years old. Six years ago he married Miss Maclure, daughter of J. C. Maclure, a capitalist of Victoria”. Like many early investors in the city, Baron Wulffsohn, (as he was sometimes described) had emigrated in 1890, and had interests in mining as well as real estate. He also acted as a shipping broker, chartering ships to carry Eurorean goods to the west coast, both to Seattle and Vancouver. In 1892 he was managing director of the Moodyville Lands and Saw Mill Company (Ltd.) on the north shore. The company’s involvement with the mill was wound up in the spring of 1896 when a notice appeared that said that they had ‘resigned the Agency of the Moodyville Lands and Saw Mill Company Ltd and had been replaced by Robert Ward & Co’. 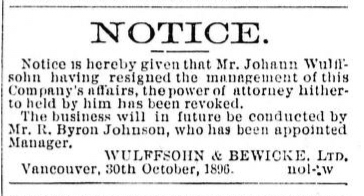 Wulffsohn’s involvement in the company that continued to bear his name was also apparently ended (or significantly reduced) at the end of that year, if this notice is accurate. We know far less about Percival Harcourt Bewicke – although he was British (which explains why he was a member of the cricket club representing the city in 1889). He was born in Jersey in 1863, and is most likely to be P H Bewicke Bewicke who resigned his commission in the British Army in 1888. He first appears in Vancouver news stories in 1889, and was living at the Hotel Vancouver that year (and was already in partnership with Wulffsohn). That year his wife, Dorothea gave birth to a daughter, Hilda, in Vancouver. Although his name appears in the 1891 street directory, it’s at the business address, and after that it’s purely the company name that’s recorded. He’s not in the Canada census in 1891, but P H B Bewicke was living in London with his wife Dorothea and daughter Hilda in the British census in the same year, and Dorothea gave birth in London to another daughter, Zoe in 1891. (Zoe died, apparently unmarried, in Poole in 1974). Today the site is occupied by a parkade, and one that’s likely to stick around for a while as it provides the parking for the SFU Harbour Centre and the offices in that building. Back in 1890 this was the office of R G Tatlow, one of Vancouver’s early real estate moguls. Although C O Wickenden had designed a building for Captain Tatlow on Hastings Street a year before this image, and another in 1894, Tatlow ran his business from the Bell-Irving Building on the south-east corner of Richards and Cordova, and the owner of the building, Henry Bell-Irving, had designed it himself. He had also designed Captain Tatlow’s home on Pender Street in 1888. Tatlow, born in Ireland but educated in England had been in the Canadian army when he first visited BC in 1879, and liked it enough to stay on. He was private secretary to two successive Governor Generals of the province, A N Richards and then C F Cornwall. He was one of the city’s pioneer investors and sat up all night to be the fourth in line to get the first CPR lots offered for sale. He lost his Vancouver home in the fire but his four year old daughter survived (his wife had died a year earlier). Tatlow had extensive business interests, including a mining partnership with A G Ferguson and architect C O Wickenden, The Cinnabar Mining Co. He served on the Park Board for 18 years, five of them as Chairman, and in 1894 was elected MLA for the City of Vancouver, serving as Minister of Finance in the McBride Government. He married his second wife, Elizabeth Cambie, daughter of Henry Cambie, in the same year, and they went on to have four children. He died in 1910 in Victoria after a fall from a dog cart when his horse was spooked by an automobile. Henry Bell-Irving was a Scot, and became every bit as successful as Tatlow. For a while the two men jointly owned a grocery business on Water Street. He arrived in Vancouver with the C P Railway, working as an engineer with his friend Henry Cambie to drive the route through the Selkirk Mountains. He arrived in Burrard Inlet in 1885 (by walking), and partnered with Walter Gravely in designing some of the city’s earliest homes. He borrowed money from Cambie to marry his Cuban born betrothed, Bella, in Devon, and they returned to Vancouver to start their family of ten children. He pioneered the export of canned salmon to Europe, founding what would become the largest canners of sockeye salmon in the world. He was elected Alderman in 1888 and became Chairman of the Board of Works. This building was his first office project and his own business was based here through the early years of the century. He developed two others in 1910, one on Richards Street and one on Granville. In 1926 there was another Bell-Irving Building developed on West Hastings. He died in 1931. The building was vacant in 1920 and we thought it had been demolished by 1925 (although there’s a 1932 image, so we were wrong). In 1933 a parking garage was built on the site – and presumably, underneath a series of makeovers, it’s still there today, 80 years on. It was popular when Spencer’s department store was next door, as they didn’t have their own facility (as Woodwards did). For its early years it was the Code 8 W Parking, and more recently was rebuilt and extended to serve as the parkade for the Harbour Centre. Here’s another Granville Street Building that’s been swallowed up by a much bigger project – in this case the Pacific Centre Mall. We thought initially that the building dated from 1910. The street directory tells us it’s the Bell Irving Block and there’s a drawing in the Archives identified as a 1910 Granville Street building whose architects are Dalton and Eveleigh. Henry Bell-Irving was a very successful businessman who had arrived in the city in 1885 and used his training as an engineer to design several of the early buildings soon after the fire destroyed the new city. He shipped the first canned salmon to the UK, and also ran an insurance company among many business interests. He designed the first Bell-Irving block at Cordova and Richards in 1888. Thanks to Heritage Vancouver we now know that this building dates to 1905, and most likely was also a Bell-Irving design, costing $20,000. The 1910 Bell-Irving building was probably on Richards Street. The retail tenants here were a series of stationers, first Norman Caple and Co, then the Odlum Stationery Company and later the Gaskell Stationery Company. In 1906 the Province newspaper reported “another $20,000 is being expended on the upper stories of this building in the fitting of up modern housekeeping suites” and in 1908 eight tenants are listed, two of them doctors. By the early 1930s the Great Northern Railway had moved their offices in, and they were still there a decade later. The City of Vancouver in an unusual move in this city expropriated the property to assemble the block to permit the construction of the Pacific Centre Mall. The earlier iteration of the mall was dark and had a limited relationship to the street. A recent renovation for new tenant H&M saw the street presence brightened up and new display windows installed. The heavy canopies were replaced with glazed weather protection, which will soon be repeated on The Bay across the street.